Black nylon pantyhose at IKEA, the deepest possible insight! You know what, I like the clips in public. Many staged clips are floating around but as you know, we don’t do a script. There is a quick idea, I grab some equipment and then we dive into the situation and look what we can get. So did Jana and I. There was one stated wish beforehand: Jana should wear a black nylon pantyhose, some trashed plimsoles and a jeans shorts. That is a picture I saw many times this summer and I really wanted to do a clip with this look. No problem for Jana as you can see. I had my large camera and a small action cam with me. In the car we had the spontaneous idea to not only do a normal foot clip, but make a shoe swap extension part. 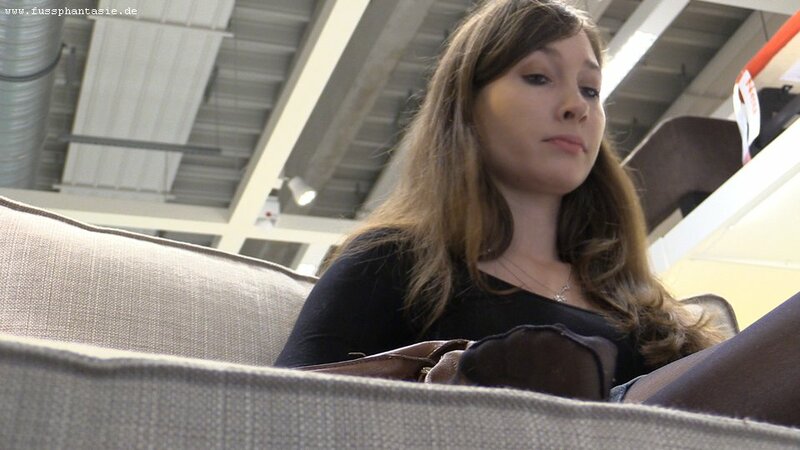 The story behind is: “That guy” who discovered Jana at IKEA in her pantyhose, got wild when she was slipping her shoes on and off repeatedly while trying out the sofas and comfy chairs. No joke, Jana wanted to keep the furniture clean so she put off her sneakers every time, regardless the many people around her. The guy began to take lurking pictures with his mobile phone and even took some short candid clips of Jana. Obviously she noticed him at some point, so he did a smalltalk conversation with Jana to stay undiscovered. But there was his chance and he asked Jana if she agrees in a shoe swap. The guy offered Jana a new pair of sneakers and she would handle him her old ones in return. Jana agreed and both went to a shoe store afterwards. But it was fun! Much fun. And I’m sure you’ll have it too when watching the 30 minutes clip, enjoy!